Black Bullet is a series of light novels Japanese written by Shiden Kanzaki and illustrated by Saki Ukai. 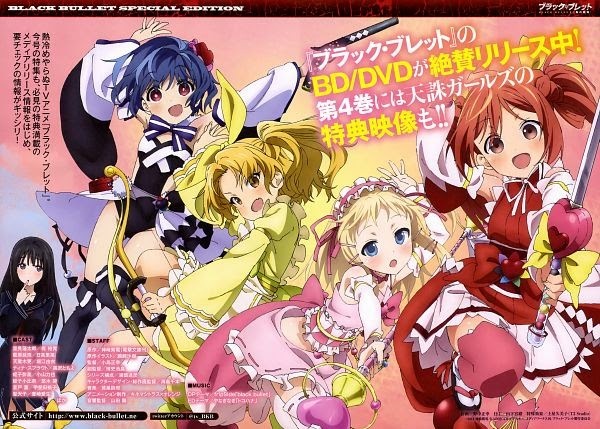 An anime adaptation by Kinema Citrus and Orange announced in the Autumn Festival Dengeki Bunko 2013 on October 6, 2013 and aired from April 8, 2014 to July 1, 2014. The soundtrack of the anime is composed by Shiro Sagisu. 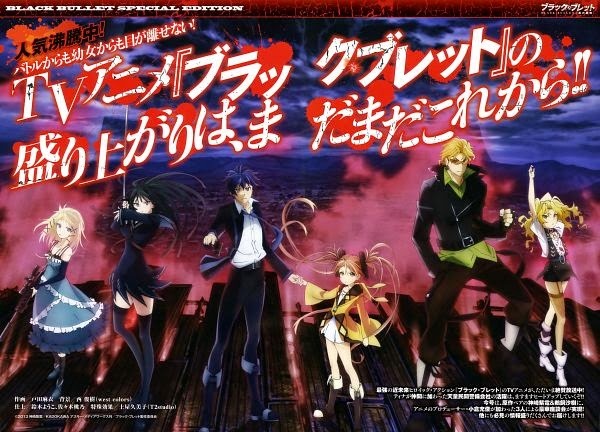 The opening theme is "black bullet" by fripSide and the ending theme is "Tokohana" by Nagi Yanagi. The year 2021, humanity is decimated by an epidemic of Gastrea, a parasite virus. The survivors are then forced to live in different areas, surrounded by walls created with the monolith Varanium material, a metal capable of repelling Gastrea. Of the disaster, were born "cursed children", children born with the virus Gastrea but are able to control it. Civil Security agencies are then formed to fight Gastrea, each group consists of a Initiator is a cursed child and a Promoter that order. Ten years after the epidemic, Rentaro Satomi, a high school student but is also Promoter in Tendō Civil Protection agency (founded by his childhood friend Tendō Kisara) and Initiator Enju Aihara, conduct missions together to prevent destruction of the Tokyo area and the world.